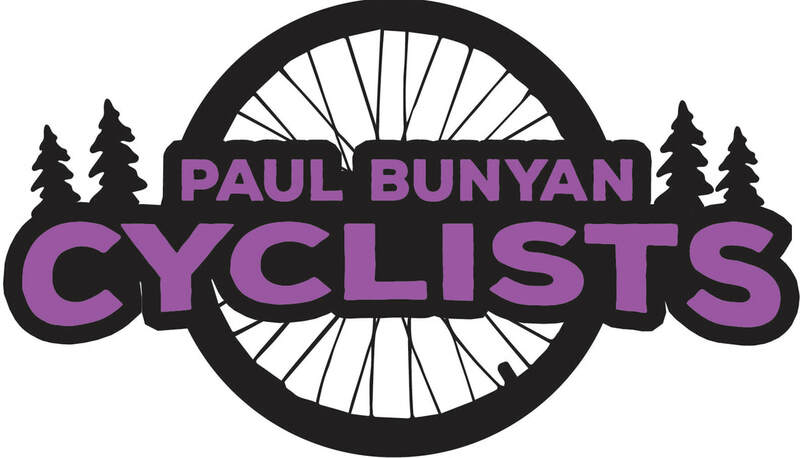 The Paul Bunyan Cyclists are a group of Minnesota Brainerd, Minnesota Lakes Area bicycle enthusiasts with a wide range of cycling interests. The club formed in 1989 and was incorporated in 1991. Members of our club hail from as far afield as Milaca, Pequot Lakes, Crosby, Staples, Little Falls, Crosslake, Clarissa, Ottertail, Thunder Bay, Canada and of course Brainerd and Baxter. Others join us in the summer from the Twin Cities and Iowa. We meet at 6 p.m. every Wednesday night during daylight savings months at the DNR, Paul Bunyan Trailhead parking lot in Baxter for road cycling - weather permitting. About every third week, a ride is scheduled at an out-of-town site. Someone will likely ride from the trailhead lot however for those who do not care to ride out of town. Typically, all riding abilities are represented and groups split off accordingly. Some ride at reasonable speeds while others are hard-chargers at 20+ mph. We have a planned route schedule for Wednesday nights (see Ride Schedule) which is subject to change determined by the riders that show up if weather (i.e. wind direction) indicates another route might be more amenable or some just want a shorter ride. While the Wednesday night ride remains the major focus of the group, some weekend rides are planned and most club members also enjoy off road riding. We also meet occasionally with our neighbor group to the West, the Lakes Area Bike Club. In addition to riding the club has a monthly meeting, held on the first Wednesday of the month, which is open to all members. We have a spring and fall dinner and schedule social events ( potlucks, bowling, skiing) in the off season. The Paul Bunyan Cyclists continue to be strong advocates of cycling and bike safety in the community. Over the years we have helped with bike safety programs through the Park and Recreation department, had booths at Community Service Day at the mall, High School Day of the Young Child and Staples Health Fair and a member taught a bike maintenance course through Community Ed. New members are always welcome. Just show up on Wednesday to ride. Note we've added a space before the @. This cuts down on spam. Please copy the email address and paste it into your email and remove the space. Thanks!